In the previous pAsuram, maNavALa mAmunigaL used the phrase “uNarndhu pAr” towards SrI rAmAnuja that means “please ponder over it”. The continuation to this pAsuram comes in the form of a question as to what makes maNavALa mAmunigaL tell SrI rAmAnuja with such an authority. What relationship does he share with SrI rAmAnuja? Why should SrI rAmAnuja consider the case of maNavALa mAmunigaL as “inevitable” and take his case for granted? This pAsuram answers that question. maNavALa mAmunigaL firmly says that he is the son of SrI rAmAnuja and that is the relationship that guarantees the inevitable nature of his case. pudhalvan – am your son , as you are my father. anRO – Is this not true? uraiyAy – Please tell me. nanRO – will it give you happiness? maNavALa mAmunigaL gives an analogy in this pAsuram. Would a father while alone, separated from his son, be able to enjoy the luxuries of life all by himself? Will he not be always thinking about the son who is far away? Certainly he will and this will make him unable to enjoy the luxuries and make him yearn to be with the son. maNavALa mAmunigaL asks Sri rAmAnuja that he is his son and questions whether he (SrI rAmAnuja) is getting any kind of happiness in paramapadham while his son (maNavALa mAmunigaL) is still suffering here. There is a father whose dear son is in some land far away. In this situation, will this father be able to solely enjoy the luxuries that includes wealth etc., that is in front of him? 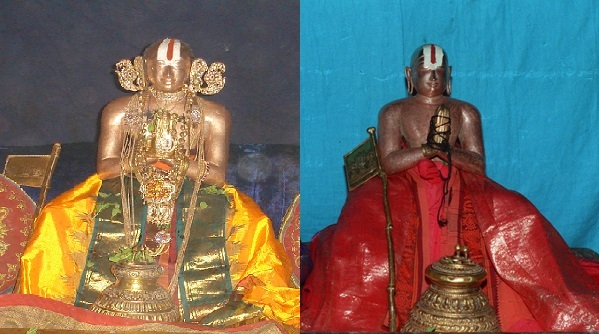 maNavALa mAmunigaL asks SrI rAmAnuja, “Oh!!! The leader of yathIs (sanyAsis)!!! In a similar fashion, adiyen is like a son to you inevitably” (as per the SrI sUkthi “kariyAn brahmatha pithA”). maNavALa mAmunigaL continues “Oh! emperumAnArE!!! Please confirm this relationship of father and son. This relationship is inherently natural. Hence, the luxuries that is described as “kattezhil vAnavar bhOgam (thiruvAimozhi 6.6.11)”, will that be enjoyed by you on the day when you did lose me? Adiyen (maNavALa mAmunigaL) does know that you will not be able to enjoy the luxuries in paramapadham as you are separated from me, your son. Hence, adiyEn requests you to kindly take me into your fold. This entry was posted in Arththi prabandham, Other and tagged arththiprabandham, mamunigal, ramanuja on June 18, 2016 by santhanam rajagopalan.